Power generation from renewable sources is expected to increase by 40% over the next five years and represent almost a quarter of global power by 2018, the International Energy Agency (IEA) said in its second annual Medium-Term Renewable Energy Market Report. The IEA, an intergovernmental policy advisor established by the OECD, cites investment from emerging markets as well as increasing cost-competitiveness of the industry as the two primary factors driving expansion. Energy from hydro, wind, solar and other non-fossil fuel resources is growing faster than any other power generation sector. Non-hydro energy alone will reach 8% by 2018, doubling its 2011 share of the renewables industry. Slow growth in Europe and the US have not impeded progress, with non-OECD countries expected to make up two-thirds of sector growth by 2018. China in particular has made headway and has outpaced other nations in power generation through wind as well as use of renewables for heat. "This is good news for a global energy system that needs to become cleaner and more diversified, but it should not be an excuse for government complacency, especially among OECD countries," said Maria van der Hoeven executive director of IEA in a statement. Money is not the main issue, according to the report. Policy uncertainty was identified as the number one risk to further expansion. Even as the industry becomes more cost efficient, the IEA warns that disparities between subsidies for fossil fuels versus renewables, as well as unpredictable markets and weak regulatory frameworks could hinder progress. Subsidies for the fossil fuel industry are six times higher than for renewable energy sources, said van der Hoeven. According to a separate study by the IEA, if fossil fuel subsidies were eliminated by 2020, carbon dioxide emissions would be reduced by 4.7% in that year. 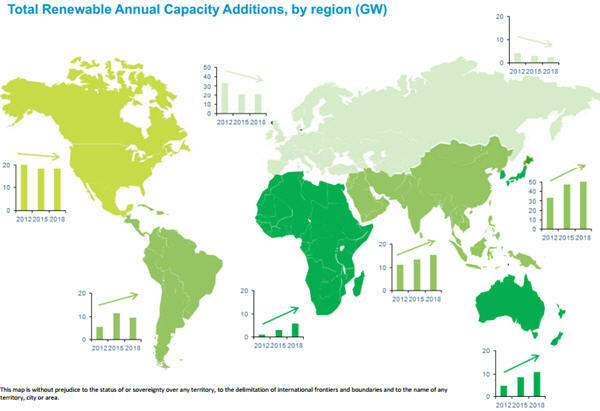 Slide from IEA showing global growth of renewable energy sector.